Kinma Race and its 18th edition, that are over a 1000 people watching, 400 kg of rice, 5 people and about 60 meters way to go. After last year’s win in the Costume Category, our school took part in that great event again, and this year with even two teams. 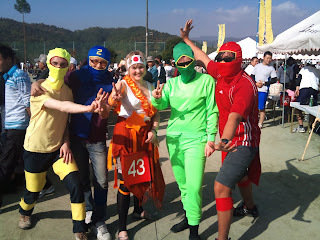 All in all 50 teams went for the win of 300.000 Yen on Sunday 14th of November in a small Japanese village called Yame. Both teams, Tasmania A and B, consisting of guest students of the University of Tasmania and other Asahi-students had to pull their slide around a pile and back to the start line. The team with the best time would win, and while some groups trained the whole year, both school teams went for the fun of it. And at the end, one of the teams even reached an honorable 11th place. After the Race, all our students had the possibility to feel, what it means to attend such a Japanese festival. We all had a lot of fun, and hope, that next year, there will be a new Asahi Team accepting the Challenge of the All Japanese Kinma Race. ‹ Our Renewed Internship Web Presentation!